Born around 1920 in San Ildefonso, Blue Corn became famous for reviving San Ildefonso polychrome wares and had a very long and productive career. Her grandmother first introduced her to pottery making at the age of three. Maria Martinez's sister gave her the name 'Blue Corn' during the naming ceremony, which is the Native American tradition of naming a child. Blue Corn attended school at the pueblo in her early years. She then went to Santa Fe Indian school, which was 24 miles from home. While attending Indian School in Santa Fe her mother and father died and she was sent to live with relatives in Southern California. Here she worked as a maid for a short time in Beverly Hills. At the age of 20, she married Santiago 'Sandy' Calabaza who was a silversmith from Santo Domingo pueblo. Together they settled at San Ildefonso where she bore and raised ten children. During World War II, Blue Corn worked as a housecleaner in Los Alamos for the physicist, J. Robert Oppenheimer. After her first son, Joseph, was born she returned to pottery making. Santiago quit his job to help her carve, paint and design her pots and by the late 1960s she had established herself as a leader in polychrome styles. After her husband passed away in 1972 her son Joseph began helping her with her pots. During the 1960s and 70s she conducted many workshops on pottery making in both the U.S. and Canada. 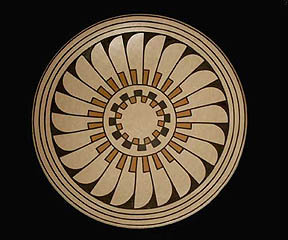 Although Blue Corn also made redware and blackware she is especially noted for her finely polished slips and exhaustive experimentations with clays and colors, producing cream polychrome on jars and plates. She is particularly well known for her feather and cloud designs. Blue Corn is attributed for the re-introduction of polychrome fine whiteware, and has received critical acclaim from several publications including the Wall Street Journal. Her pottery can be found in the Smithsonian Institution and other leading museums throughout America and Europe as well as in private collections. She has won more then 60 awards including the 8th Annual New Mexico Governors Award in 1981. This is New Mexico's greatest recognition of artistic achievement. She passed away May 3, 1999, leaving 10 children, 18 grandchildren and 10 great-grand children. 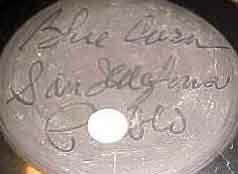 Blue Corn (1921-1999) black-on-black. Blue Corn Famous Artist is (Crucita Calabaza Calabazas) She made pottery for over 70 years. She helped reintroduce polychrome pottery in San Ildefonso, where it had virtually disappeared after the popularity of Maria Martinez's blackware. Blue Corn and her husband experimented with many different colors of native clay, developing her distinctive subtle color combinations and fine polish. 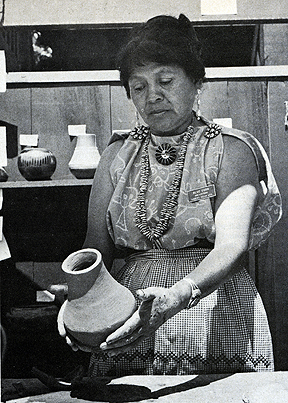 Blue Corn was born in San Ildefonso around 1923 and was encouraged by her grandmother, at an early age, to 'forget school and become a potter.' She did attend school at the pueblo and later at the Santa Fe Indian School, however. At age 20, she married Santiago, a Santo Domingo Pueblo silversmith. During the 1940s, she worked at Los Alamos as a housecleaner for J. Robert Oppenheimer. Shortly after World War II, she took up pottery making and found her calling. Blue Corn is famous for re-introducing San Ildefonso polychrome wares which had become a lost product after the blackware of Maria and Julian had become in such demand in the 1920s. She also made blackware and redware but is most often associated with polychrome wares.